I have always loved a good deal and one of my favorite places to shop is Publix because they always have the best BOGO prices! 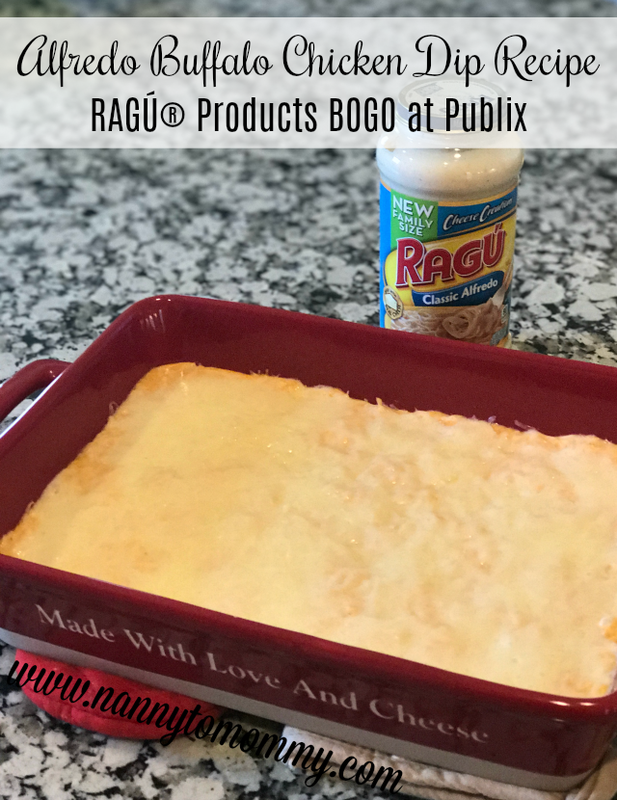 NOW through October 11th, you can score BOGO savings on RAGÚ! I love RAGÚ products because they are so versatile and make meal time so much easier, plus I know I am making something my family will enjoy. Besides traditional pasta recipes, I am a fan of Alfredo Stuffed Chicken, but in our house - game time means family time. Today I want to share a super easy recipe. 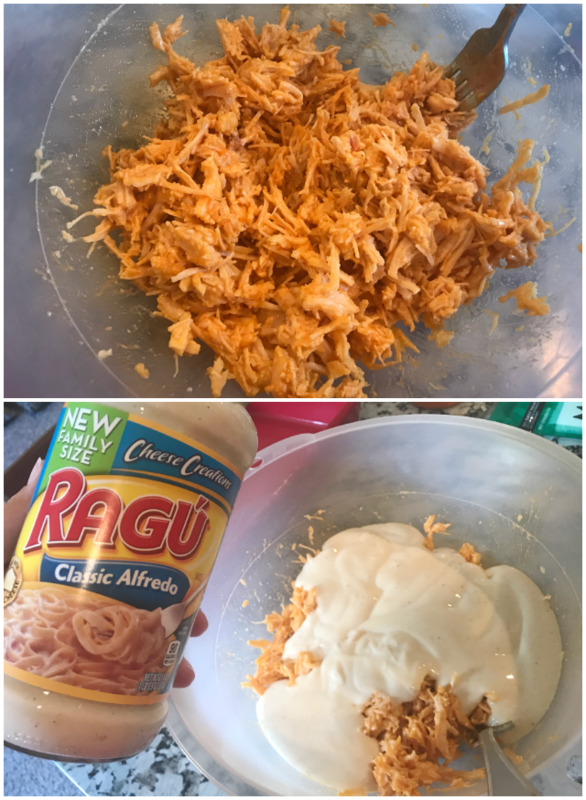 Alfredo Buffalo Chicken Dip made with RAGÚ Family Size Cheese Creations Classic Alfredo Pasta Sauce and only THREE other ingredients! RAGÚ Classic Alfredo is a thick, creamy Alfredo sauce made with real cheese and fresh cream and packed with Parmesan and Romano cheeses so it is bursting with cheese flavor! You can get it in 16 oz. and 21.5 oz. jars. My husband said this was not only a unique twist on a traditional recipe, but a very yummy take too! 2. Combine chicken and buffalo sauce in bowl. 3. Then add Alfredo sauce and about 3 oz. of shredded cheese. 4. Add combined ingredients to 3 quart baking dish. 5. Top with rest of shredded cheese. 6. Cook in oven for about 20 minutes or Until nice and bubbly on top. 7. Let cool about 15 minutes and serve with chips. We chose tortillas, but you can do whatever you'd like. What do you think of this twist on Buffalo Chicken Dip? Do you like to make appetizers for special events? Comment letting me know if you try it! This dip looks yummy. I'd never think to add alfredo sauce to a dip. I'll let you know if I try this! This looks delicious! I would have never thought about doing something like this to make a dip, but why not, Looks so tasty!! This looks really good and so easy to make! Oooh I have made this before but never with alfredo!! I feel like alfredo makes it like a million times better lol!! Must try! This looks so good and the addition of jarred alfredo makes it quick and easy to do. I will be trying this one on game day! This looks delicious! We have appetizers on New Years Eve and this would be a great addition. Alfred buffalo chicken dip would be delicious with a ton of stuff! This looks yummy and easy to make. I love my alfredo sauce too. Looks like simple and straightforward recipe. I use alfredo sauce from Ragu to make my spinach artichoke dip. A bonus is they make a 'light' version for the health conscious like myself. This definitely sounds like my kind of dip, yum! I love cheese, but then again I don't know very many people who don't. :) Thank you so much for sharing! I buy this sauce often/ I am going to give this a try! 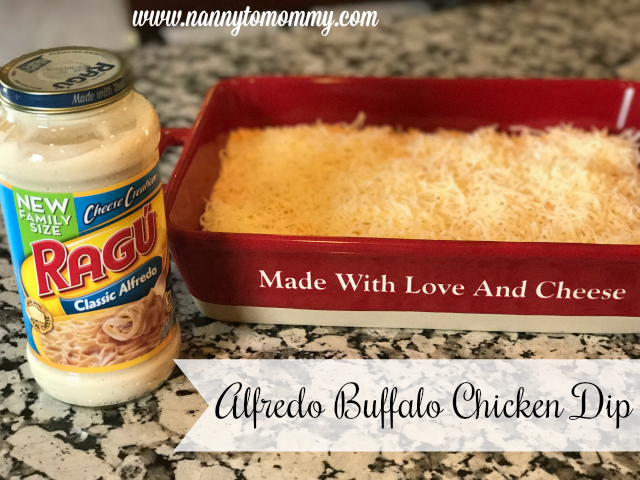 I love making my buffalo chicken dip but never considered using Alfredo before! I'll have to give this a try. What a yummy looking sip. I like how easy this is to make. This looks delicious and I think my family would love it on game day! This looks so yummy and I know my family would enjoy it! This looks and sounds delicious. I'm always looking to find new and different dip recipes and this puts a new twist on the buffalo chicken dip. This looks so yummy and I can't wait to try it! This is so tasty looking. I will make this for my next Sports Sunday friends gathering.